In a recent post, Craig Morris took a critical look at US linguist’s recommendations for “framing” the energy transition better. Today, he sheds light on how he, perhaps unintentionally, followed George Lakoff’s advice nonetheless for years to change perceptions about the Energiewende. It started with this website. Myth-busting is the kind of trap Lakoff talks about: you repeat someone’s misrepresentations to prove them wrong. But of course, by repeating the myth, you also reinforce it in the reader’s mind. Take the example of the Energiewende’s cost. When a report comes out alleging a high cost, I can rebut it (or at least put it into context), but I cannot do so without reinforcing the idea that 1) cost is a crucial, and possibly the most important, aspect of the Energiewende and 2) that I am on the defensive in talking about it. Back in 2012, I already felt that rebuttals allowed others to set my agenda. No one in Germany seemed to have anything good to say (that, in itself, typically German), so foreigners must have wondered why the Germans were even pursing the transition. So I set out to tell everyone why. By that time, this website had also been launched in the fall of 2012. Its structure may not seem unusual, focusing as it does on technologies and policies, but we created a separate Q&A for myth-busting to get those points out of the main text. And the inclusion of a history section was indispensable towards emphasizing society’s role in the Energiewende, which began as a grassroots movement for greater citizen input in the energy sector (which we call “energy democracy”). Usually, Germany’s energy transition is presented simply as the technical implementation (by experts) of a national energy policy (drawn up by experts), not by citizens who forced their government to let people make and sell their own energy profitably. To understand how rare our emphasis on society remains, take this amazingly detailed chart (PDF unfortunately only in German) by think tank Agora Energiewende from 2016, which leaves out society altogether – no mention of any grassroots movement! 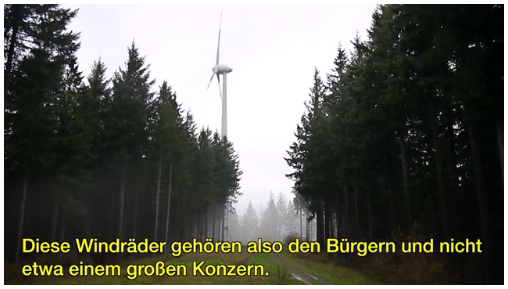 My documentary includes two music videos: one celebrating the central role that conservatives have played; the other, pointing out that the Energiewende will at least answer a question everyone has – can we switch to renewables? What’s there not to like about experiments? Last but not least, there’s the new book I coauthored, whose title says it all: Energy democracy. So I’ve been working to follow Lakoff’s advice all along and get my communication of the Energiewende into the frame I want. I wasn’t reading him, but I knew his work from my studies of linguistics back in the early 1990s, before he became overtly political. But we need to go further: my excursions into videos and graphics are an attempt to reach a wider audience, something Lakoff does not emphasize. What Lakoff proposes is thus mainly good advice for a general, long-term debate addressing the public. But there is one more aspect about Lakoff’s focus on framing: it is a response to a uniquely American school of conservatism, making it of limited applicability in Germany and possibly elsewhere, as I will explain in a future post. One framing issue that the Energiewende may have is that it arose as or became a movement about electricity supply. The other three wedges of the transition are heating, efficiency and transport. My capsule impression is that Germany has done reasonably well on industrial efficiency, though not as well as the UK (perverse cross-subsidies to energy-intensive industries don’t help), well on heating – very well on residential construction standards, and horribly on transport. The German car industry is more powerful than its coal one. Do Germans see the switch to electric cars as part of the Energiewende at all? How many German cities have switched to electric buses? IIRC none. The German “freedom” to drive a gas-guzzler on the autobahn at 180 kmh is to outsiders nearly as perverse as the American idolatry of gun ownership. The dialectics are interesting for the linguists, for PR agencies but concerning the costs of the Energiewende the numbers are more appropriate. Germany/Austria have about the cheapest power price in Europe ( http://www.platts.com/latest-news/electric-power/london/german-prompt-power-prices-bearish-french-spot-26661512 ) and about the strongest (steel-) industry. Other countries lack the quantity or the availability(SAIDI) of RE-eelectricity or hydrogen storage capacity (in the case above the gas grid and the pumped hydro power) ready connected to their steel mills and to their industry – or are simply not compete-able with their power price. The Energiewende has reached now the non-electric industry. Progressive thinking was certainly helping to get there, sure, but conservative bankers are behind it. On the German side, don’t people like Hans-Josef Fell also deserve some credit in this respect? All and the most, Fell is hero in my point of view. His surprising success in getting the EEG through is a tribute to political skill allied to determination. As far as I can see, the Greens got it through because they cared a lot about the issue while the two main parties hardly cared about it either way ad did not think it would lead to anything. The Greens used the leverage wisely. On historical comparison is with William Wilberforce and the abolition of the slave trade in the British Empire. Unlike the American abolitionists like Adams, who could not agree on a clear strategy, Wilberforce and friends chose to focus first on the slave trade. This left the legacy of slavery in the West Indies untouched. Abolishing the trade actually raised the value of legacy slaves to slaveowners, so they could live with it. It took until 1833 to abolish slavery itself. Wilberforce just lived to see it. Have none of you read my book? Fell was once crucial person, yes, but the SPD’s Hermann Scheer was indispensable. And there were many, many others. The EEG of 2000 was by no means a Green idea that got snuck past the SPD, the larger coalition partner. Scheer spearheaded its passing, while Fell handled the wording more. My intended point was that there is also a tradition of ‘positivity’ in Germany, which Fell is now continuing as a ‘media personality’ and elder statesman. I just thought that in the article above your dismissal of German style was too sweeping. But I completely agree with your framing concerns and greatly appreciate your continuing engagement and media work (and oops, I have not read your book, will fix this soon).